As a technical communication professional, you know your work is valuable. But what if you're called upon to define, defend, and promote that value? Is it enough to say that good technical content reduces customer support costs? No, it’s not. 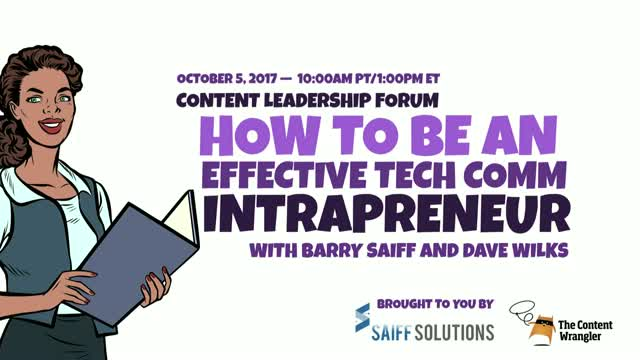 Join me, Scott Abel, The Content Wrangler, and technical communication management experts, Barry Saiff, CEO of Saiff Solutions, and Dave Wilks, Senior Technical Writer at Cloud Elements, for a free one-hour webinar to explore what it takes to communicate value to upper management effectively. You’ll discover how adopting an “intrapreneurial" mindset can help you sell the value of innovative ideas, new approaches, and improvements in technology. And, you’ll leave equipped with practical actions you can take to convince “bottom-line” focused management that spending money on technical documentation can help them achieve their business goals.